The new Angel City is directly derived from the well-known and test winner Angel GT. Technology and tread pattern design have been reviewed and adapted to smaller displacement bikes, with a X-Ply construction and dedicated materials. 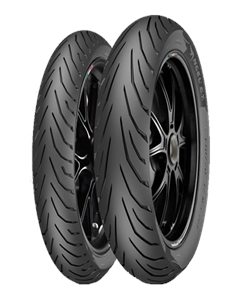 The new tyre addresses the needs of sporty bikes up to 250cc, underbones and other commuting bike. The robust tyre construction ensures high puncture resistance and performance consistency throughout the entire tyre life. The benefits of Angel City are clearly perceived in any riding condition, especially on uneven road. The tread pattern guarantees optimal wear and improves water evacuation. Angel City features a new compound mainly based on carbon black with a calibrated percentage of silica; it is able to deliver excellent grip on both dry and wet, tear resistance and mileage.